Baseball and softball are returning to the Olympics in 2020, while skateboarding, surfing, karate and sport climbing are joining the games for the first time. The International Olympic Committee approved the addition of the sports for the Tokyo Games. The IOC called it an "innovative" mix of traditional and youth-oriented events that will attract Japanese and global fans. The five, including a combined baseball-softball bid, were put forward for inclusion last year by Tokyo organizers. Under new IOC rules, host cities can propose additional sports for their own games. IOC members voted unanimously to accept the five sports as a package. The approval was for the Tokyo Games only. The new sports will add 18 events and 474 athletes to the program. The Tokyo Games will now feature 33 sports and about 11,000 athletes. That is compared to the usual number of 28 sports and 10,500 athletes. Men's baseball and women's softball, both popular in Japan, will return to the Olympics after a 12-year absence. The other sports will be making their Olympic debuts. The IOC called it "the most comprehensive evolution of the Olympic program in modern history." Baseball and softball have been off the Olympic program since the 2008 Beijing Games. The two were rejected in separate bids to return for the 2016 Rio de Janeiro Olympics. They combined forces to put forward a single bid for inclusion in Tokyo. Men's baseball was a full part of the Olympic program from 1992 to 2008. Women's softball was added in 1996. The IOC voted them out in 2005. Baseball will have a six-team tournament. That is short of the eight-team format sought by officials from the sport's international federation. Women's softball will also have six teams. The games will be played in Yokohama. Major League Baseball Commissioner Rob Manfred welcomed the IOC vote. "Baseball and softball are global sports that belong in the Olympics," he said. Manfred added that their approval "will allow fans throughout the world to again enjoy baseball and softball on the Olympic stage." Craig Cress, executive director of USA Softball, said many young players had suffered after the sport was removed from the games. "Their hearts were broken that they weren't allowed to participate for their country at the Olympics in the sport that they had a passion for," he said. "Now that's back. In 2020, it's our job as ambassadors of the sport to put on a great show in Tokyo." Before the vote, several IOC members questioned whether baseball would have the world's top players at the games. While pro leagues in Japan and some other countries have agreed to shut down their seasons to send their players to the Olympics, MLB has declined to do so. 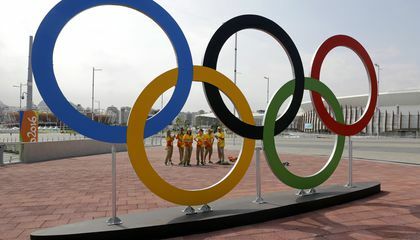 Franco Carraro, who chairs the IOC's program commission, said he hopes the international federation can still reach an agreement with MLB, in line with the deals with the NBA and NHL that brought pro basketball and ice hockey players into the Olympics. Skateboarding will have street and park events. It will and feature 80 athletes, 40 men and 40 women. In climbing, 40 competitors will take part in the disciplines of speed, bouldering and lead (also known as sport). Karate will have 80 athletes competing in men's and women's Kumite and Kata events, while surfing will have two shortboard events for 40 competitors. The surfing competition will be held on natural waves at a beach location in Chiba prefecture. "Our Olympic dream has now become a reality," International Surfing Association President Fernando Aguerre said. "This is a game-changing moment for surfing." Skateboarding and sports climbing events will be held in temporary venues in urban settings in Tokyo. Karate will be contested at the Nippon Budokan in the capital. Why do Olympic officials consider adding new sports? The Olympic officials are adding new sports because it will get more people motivated. It will make more people want to play the sports on an Olympic games than on a regular team. They want more people to play the games. They are mostly usually filled so,if they get more games then, more people can play. They want the same amount of games and people on each team. To conclude, the Olympics are adding new sports for more people to participate. The Olympic officials are adding new sports because to have more people watch the Olympics. Some of the athletes explained that "Their hearts were broken that they weren't allowed to participate for their country at the Olympics in the sport that they had a passion for." When the officials voted the players out they thought that they weren't good enough.Now they are going to train harder.The reason is that the Olympics are for people who are the best of the best.Now they are going to prove that they are the best of the best in 2020. The officials want more of the younger generation to watch the Olympics.By adding these sports to the Olympics officials hope for more of the younger generation to be interested in the Olympics. The Olympic officials are adding new sports because it will get young people motivated. It will make more young people want to play the sports. They want more people to play the games. To conclude, the Olympics are adding new sports for more people to participate. I think that they made the games harder so that the Athletes would work harder and be more competitive with the new sports and bigger crowd. the addition of all four new sports will end up being a good idea which will draw more attention to the Olympics. In response to "Why do Olympic officials consider adding new sports," I agree that they should keep adding sports to the Olympics. One reason they should do this is because many people have been living up to the Olympics and dreaming of the Olympics forever. Although some people have dreamed and trained, they can't go to the Olympics because their sport is not a part of the Olympics. Another reason is that more contestants also means more fans so there will be a likely chance of more people watching the Olympics. It says in the article that "Baseball and softball are returning to the Olympics in 2020" and skateboarding, surfing, karate and sport climbing are going to be new sports to the Olympics. A third reason is that everyone will be excited about these new addition to the Olympics and it will be see interesting for people to see how it will turn out. Another reason it is good is because the sports will become more popular. In my opinion I think that the Olympic officials considering adding new sports to the Olympics is a positive effect for athletes, fans, and the sports. In response to "Your in! Four new sports make the cut for the Tokyo Olympics" I agree that baseball and softball should be in the 2020 Olympics. One reason I agree is that many people play those sports and, more people will have the experience of being in the Olympics. Another reason is that when you add more sports that younger people like to watch there will be more younger viewers. It says in the article that the 2006 players were heart-broken when they weren't allowed to play for their country and now they can. A third reason is it will allow people to enjoy watching baseball and softball on the Olympic stage. Even though the olympians that are doing baseball for MLB and the Olympics will have a lot to do, I think it will let them have the experience of doing both. they could add a lot more. In response to 2020 olympics bringing back baseball and softball,I agree they should bring back baseball and softball and add skateboarding,surfing,karate,and sport climbing. One reason why I disagree is because there is 11,000 athletes in the 2020 olympics. Another reason is because skateboarding will be split into 2 different events street, and park.The surfing competition will be held on natural waves. It will be at a beach location in Chiba prefecture, that sounds like a really good surfing spot. Even though there is 11,000 athletes performing, I think it is going to be a good 2020 olympics.